With over 9 million horses being used in the U.S. for sport or recreation each year, there is strong demand for training facilities where riders can receive proper instruction and board their horses. A riding stable business can be a fairly profitable venture if it is properly planned and managed. Individuals starting a riding stable should either have extensive experience training horses and riders themselves or hire riding instructors with this experience. Even if the facility owner does not have experience in all aspects of forming a riding stable, it is important that they find and hire appropriate personnel to assist with the venture (including an experienced barn manager and support staff). The easiest way to start up a riding stable is to purchase or lease an existing facility, but some individuals choose to purchase a tract of land and build to suit. A riding stable must provide its clients with arenas where they can practice. The best (and most costly) arenas are the covered “indoor” sort, with lighting that allows riders to train at all hours. A more common and affordable option is the “outdoor” arena, which is not covered. A key element of either type of arena is that they use a safe, consistent footing that it routinely dragged to ensure it is kept level. Footings may range from sand or dirt based options to the most expensive synthetic creations. Additional features such as jump courses, round pens, and trails are often added. The facility must also have a barn with stalls, a feed room, a tack room, an office, fenced paddocks and fields, water troughs, proper storage areas for hay and bedding, and a full array of maintenance equipment. If the stable will provide horses for use in lessons, a reliable group of horses must be acquired, along with necessary equipment such as brushes, blankets, and riding tack. It can be a significant expense. Riding stables must comply with all local laws, including zoning regulations and business licensing requirements. They should also secure insurance and post the standard limitation of liability notices around the premises. Riding stables may offer lessons using facility owned horses or those owned by clients. Both group and private lessons are usually offered, in either hourly or half-hourly formats. The facility may also offer transportation for the horses to shows and other competitive events. 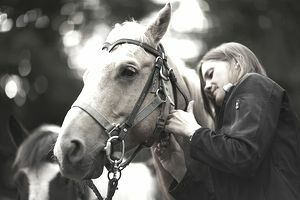 Boarding options for client horses are usually also offered. Every riding stable needs access to quality farrier services and veterinary care, so it is important to secure these relationships immediately. Suppliers of bedding, hay, and feed must also be identified. It is important, especially at the outset of your venture, that services are priced competitively for your area. It will give new clients a financial motivation to try your services. Research your competition by calling around to other facilities or visiting their websites to learn what they charge for similar options. It might also be a good idea to offer incentives to get the business up and running, such as new client discounts or referral credits. Well known, established riding instructors will be able to command higher prices for lessons and clinics. They may also bring clients from their previous facility to yours, which is an added bonus. Be sure to advertise your riding stable at local equine facilities like feed stores, tack shops, and showgrounds. Local newspapers and equine magazines may also be good ways to reach your target audience. Advertising in horse show programs or publications from other major equine events can also be an excellent business decision. If your facility’s riders perform well in competitions, this might draw additional clients who are interested in trying your trainer’s methods to achieve similar success. Many riding stables create a website with photos, pricing options, and full details on their training program and competitive successes. The more information that can be placed online, the better. Over time, the best advertising will come by way of referrals from satisfied clients. One well-connected customer can provide many referrals to their friends and fellow riders. It is the kind of advertising that money can’t buy.